A herd of PzKw III! As I mentioned the first thing I tackled was the 120+ road wheel castings and rubber tires. My goal was the make them as nearly identical to each other as possible. I say this as I did not cast these , don't know who did them all( some where from Thomas Wittgrebe) and there were variations. This represented days of machining so I could fit bronze bearings to them. I also made 2 vulcanizing rubber tire molds, magaing to crack one as I attempted to compress raw rubber into it before realizing I hadn't made expansion vent holes. The wheels are finished to the point of mounting but I still need to make and mount covers( hubcaps). I will make a die to press these from thin steel or aluminium. The next section will discuss the effort I follwed to make the final drive housings. As I mentioned earlier I decided that I wanted these units to be self contained components to simply be located in the right position on each model and then bolted in place more or less like the originals. To be included is a 3 or 4 to 1 reduction gear I believe I settled with a 4:1 ratio. For the pattern I used some parts that had been included with one of the parts lots I'd purchased years back but with significant modifations. As I also indicated above I revised these patterns twice and below I will show what I did and the considerations I had to take into account. In building the final drives I had to consider the spacing in the sprocket with respect to the tank hull- this spacing is critical to the proper 'tracking' of the track and if incorrect by any significant amount would contribute to the model 'throwing' its track particularly under load and during turns. This spacing, assuming the sprocket itself is made correctly is primarily influenced by the thickness of the final drive housing and associated parts. As many of you know I generally do not work from prints but rather sketches and simple drawings I make as I go. I wish I did have prints. I realize I could make them using any number of CAD programs but even though I've wanted to learn one of them I've never sat still long enough to do it. So I continue to use my tried and true methods. Next several photos show brass bearings in place and beginning machining operations. Next photos show bolt pattern holes drilled. 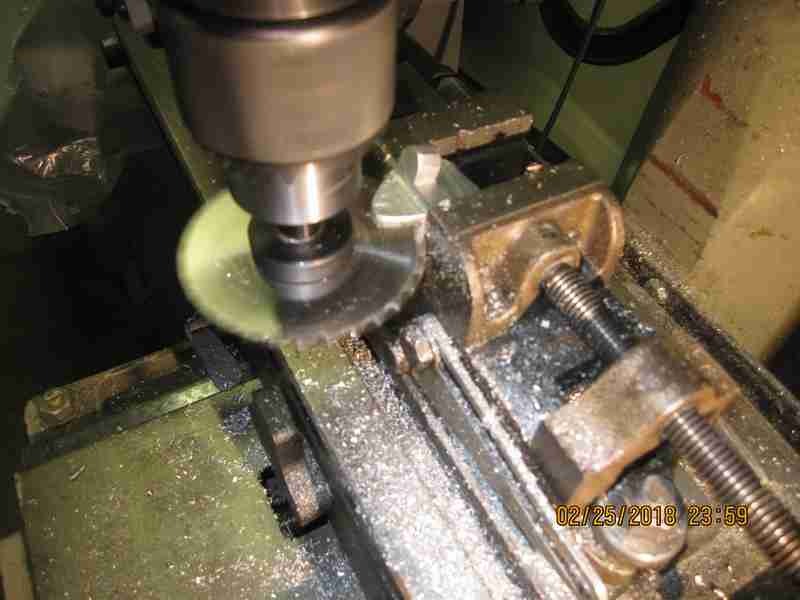 I made a special counterbore to machine the flat bolt head recesses. Also made a steel drilling template to drill all the mounting holes the same( except for first parts). The following photos show making and installing the support bearings for the pinion gear shaft I used a very fine thread for the bearing shell mounts.